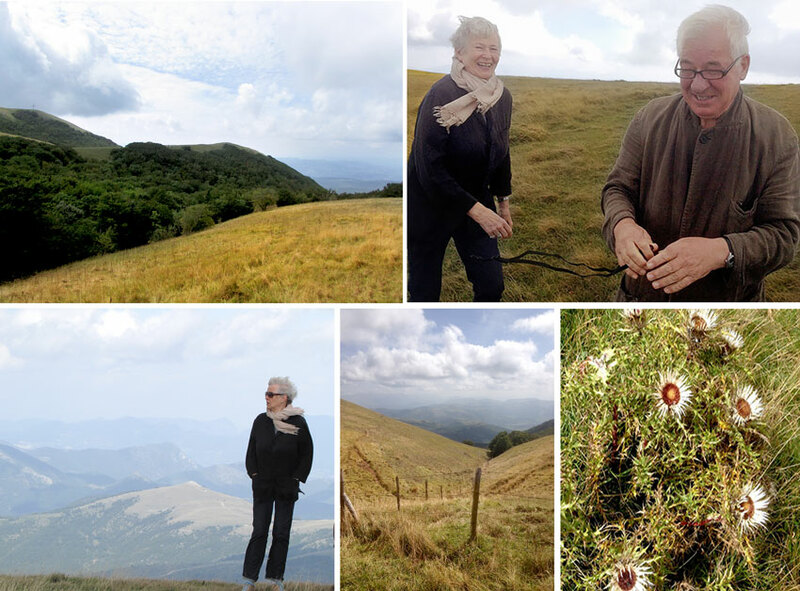 My friends Rixa and Peter had been telling me how beautiful Monte Pennino was and finally I got to make the excursion with them this past year. And it was as spectacular as they said. Beyond Nocera Umbra and just about as hidden as a huge mountain can get. (How to get there is the difficult part. You can find the mountain on the map but someone needs to show you where the road up to the top is. But Rixa promised a mountain picnic so we were going to make a day of it. We met in front of the palazzo, loaded up, and set out in the direction of Assisi then onto the highway heading south toward Spoleto. I had forgotten what a harrowing experience a drive out with Peter could be. Just like I’m never sure exactly where a conversation will go with him, it seems that behind the wheel things were just as up in the air. Passing Foligno, a crossroads for highways and trains alike because of the break in the Apennines, we headed in the direction of Nocera Umbra, which is relatively uncharted territory for me. The scenery was quite beautiful but, no matter how much I whimpered, Peter would not stop to let me take a photo. We passed dozens of potential shots as I tried not to beg. (Begging is never pretty.) Up and down hills and around curving roads that offered glimpses of hill towns nestled within tree tops hills and rocky crags we went. Each missed photo like a stab in the heart. Once past the mountainy bit, the road led us into more open land as Peter led us into little villages from which I was sure we’d ever find our way out. “I’m sure this is the way,” he said at least half a dozen times. “This is the way, I think,” he said as we entered something with the word ‘crocera’ in its name. Then turning to the right we entered a street, if you could call it a street, with a collection of dilapidated buildings that could really not be called houses. Their crumbling walls – not of stone but rather the Italian equivilent of cinder blocks – could most certainly not be considered habitable yet their front yards boasted tractors and pickup trucks and scatterings of chickens. I felt we has stumbled across the Italian Appalachia. Suddenly the road came to seriously narrow section I was sure we couldn’t get through. Instead of reconsidering our coarse, Peter, against some serious begging that we needed to turn around, shifted gears and pushed forward on what had become just two muddy tracks through the trees. He had spotted something familiar up ahead and amazingly we emerged at the other side on a nearly paved road. “There we are,” he exclaimed with a bounce and flashing a smile. The relative smooth sailing lasted only a few minutes until Peter made a sharp left where the road curved right at the top of a slight crest onto a narrow and well worn white (unpaved) road. It seemed we had found the right road at last. Back and forth along the seriously rutted path we bounced as we began to make are way up the hillside. Downshifting, Peter engaged the four wheel drive and the added traction, while not making the ride less bumpy, did offer slightly more of a sense of security. We passed a jeep, two ancient Pandas, and two pick up trucks either parked alongside the road and slightly jutting out or partially concealed in the bushes. I seriously wondered if a hike with so many hunters around was really a very good idea. Then, with a yee-haa (think Austrian accent) Peter gunned the engine, which spun the tires a little, as he left the relative safety of the graveled road and headed up the last part of the hill. Yes, we were off road, as they say. Arriving with his customary flourish at the very top of the treeless ridge. Rixa and I were sure he’d take us off the other edge like in Thema and Louise but he abruptly came to a halt. Rixa and I jumped out into the stunning panorama only to be battered on all sides by an exhilarating wind. So strong and loud in fact, it was difficult to hear each other speak. Our words went only a few feet before being swept away. No matter, we mostly laughed until the wind made our eyes tear. It was an exercise in high altitude pantomime as we skipped about acting much younger than our ages. Maybe it was a lack of oxygen but it was breathtaking to say the least. Too cold to stay there for long, and deciding it safer to walk back down, Rixa and I waved good bye to Peter who gave us his pouty face as he climbed into the 4×4. Rixa and I enjoyed a few moments without Peter’s comedy routine. I noticed that her scarf made flapping sounds in the breeze. Strange how still the hills were when all extraneous noise had been whisked away allowing such a small sound to be isolated. Our voices sounded hollow in an odd yet intimate way as we chatted on in a space void of ambient sound. We thought we were completely alone until we noticed two people come over the crest of a nearby hill heading in our direction. It reminded me a bit of that scene in Alfred Hitchcock’s The Trouble with Harry when Shirley MacLaine finds the dead body on a hillside. They were an odd couple, an older man and a 20ish woman – possibly father and daughter – both sporting large baskets over one arm. Rixa and I waited until they were close until we greeted them and asked what they were looking for. It turned out they were mushroom collectors, which explained what we thought were hunter’s vehicles parked along the road on our way up. Peter joined us and we did our best impression of a United Nations Security Council meeting. It was all mushroomy talk but in a mixture of Italian, English, and German. We left sated that our attempt at international diplomacy had been so successful. Monte Pennino was still safe for travelers from around the globe. Once in the car we wound our way back down the other side of the mountain. Around one bend we came across a group of grazing cows set against the washed out backdrop of the next ridge. I knew it would made a wonderful photo and Peter, acquiescing, pulled over to let me out. As I was crossing the field in their direction, I saw an old woman who was mushroom hunting as well. (This time I was reminded of a semi-surreal mountaintop encounter suitable for Andrew Wyeth.) Assuming an old woman encountered on a mountaintop would certainly know her way around wild mushrooms, I showed her the few things I had collected and asked her advice if they were edible. She shook her head and told me she always asked her son before she ate anything she found. 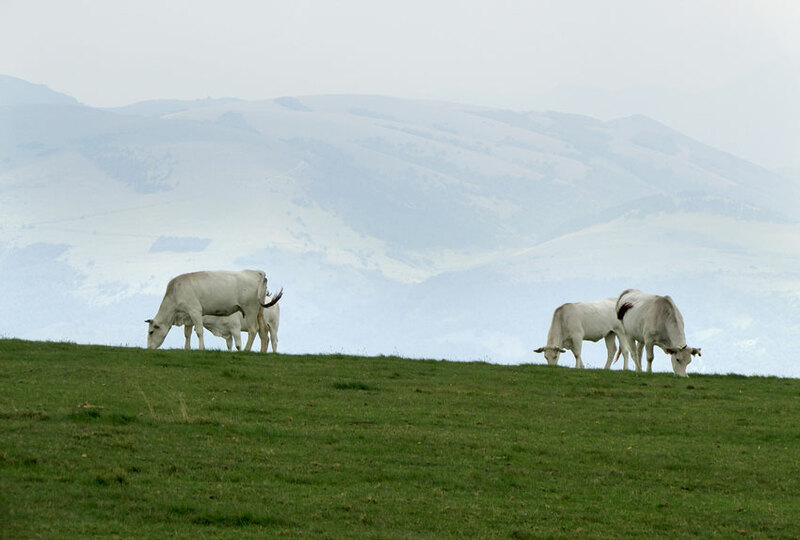 I then turned my attention to the cows who, on closer inspection, turned out to be bulls. I finally noticed there wasn’t an udder in sight. Very glad I hadn’t gotten too close, I headed back to the car discarding my mushrooms along the way. Peter was grinning broadly when I got in and asked what I thought of the cows, which – so like him – explained why he had offered to stay in the car. After a few false stops in our search of the perfect picnic spot, Peter pulled the car off the road into the side of a hill and announced we had arrived. There was a view of the hills rolling down to the valley, not too much of a breeze, and an outcropping covered with poppies, which was welcomed if not abnormal for October. Peter and I laid out the blankets (trying to avoid the thistles) amid the other wild flowers. Rixa opened the basket and set out dried sausage, prosciutto, tomatoes, and a soft pecorino on tin plates enameled with a checkerboard pattern. She passed out bright red cloth napkins, which I thought very classy, while I opened a bottle of Grechetto I had brought along. After a lunch filled with mostly fabricated stories Peter was known for dishing out, we headed back to Nocera Umbra. Possibly making up for not stopping earlier or more possibly for the cow incident, Peter made two stops for photos along the way. Coming up to Nocera Umbra, we drove around the wall and entered to find the town rather deserted. The sky began to cloud up so, finding a parking spot in front of a church, we heading into a bar where I ordered three cappuccinos. Yes, yes, it was too late in the day for cappuccinos but they’re German and I’m American and we doubted the word would get back to Bettona. I’ll go back and explore the area more in the future.